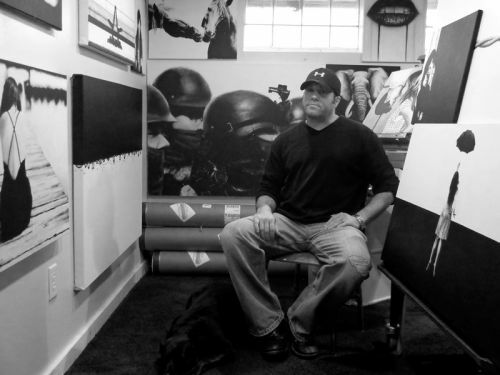 Columbus native, Adam Kiger, comes from a long line of acrylic and oil artists. Adam began painting at the age of six years old under the instruction of his family. After attending The Art Institute of Pittsburgh in the early ‘90s, Adam moved to Atlanta, Georgia to begin setting the foundation for a career as an Internet architect. Over the next seventeen years, Adam’s graphic design and marketing background would play an essential part in producing award-winning projects and client solutions for over 80 Fortune 100/500 companies in the United States. Once Adam’s career was solidified and his daughters were older, in early 2013, Adam became reacquainted with his natural artistic talents. Adam coupled his almost two decades of professional experience with his artistic passion and within six months, he reached his goal of having his work in New York City. Adam signed with Agora Gallery in Chelsea, NYC. in the fall of 2013 and his first exhibit is set for July 5-25, 2014. Shortly after, Adam was offered a sponsorship from Genie Canvas, also based in New York. But Adam hasn’t stopped there! In the past year, Adam’s work has shown in multiple locations in Columbus and he is dramatically increasing his efforts to establish and solidify long-term exposure of his work locally. Adam’s paintings will also be shown in Los Angeles, California in June of this year, the Hamptons, New York in August and he has also set a new goal to have some of his works displayed in London, Paris and Rome by 2018. Adam Kiger is an acrylic artist living in Columbus, Ohio and is represented by Agora Gallery (http://www.agora-gallery.com/artistpage/adam_kiger.aspx/) in Chelsea, New York. Adam is also sponsored by Genie Canvas (http://geniecanvas.com/) located in Red Hook, New York.